I’m an advocate of creative approaches to ropes and rigging — both in training and in the field. These are the spaces that turn gears and illuminate light bulbs. These are the spaces where we evolve as vertical practitioners. This little experi ment all started with the simple pull of a magnet fixed to a refrigerator. The magnet popped off in my hand. “That must be around 5lbs of force,” I thought. I just wrapped up a section on load sharing anchors while leading a climb training for Greenpeace USA in the Summer of 2014 and curiosity got the best of me. Could I build an anchor out of these simple magnets? How many would it take? And so it began. I weigh around 160lbs. Divide that by 5lbs (my estimate of how much force it took to pull the magnet off the fridge) and I was left with 32 — the minimum number of magnets needed to hold my weight. This is assuming that my estimate was accurate, that I would be able to equalize all the magnets ‘perfectly’ and that additional forces don’t exist when getting onto or suspended from an anchor. Knowing better I decided to double the amount but after searching the warehouse for every magnet available I was left with 51 magnets so 51 magnets it was. My friend and fellow rope nerd, Van and I quickly got to work tying loops made from random bits of 2-4mm accessory cord to the plastic knobs on each magnet. These would become the individual anchor points for each of the 51 magnets. We divided these into clusters that we painstakingly equalized into seven load sharing anchors. These seven anchors were then brought together and equalized to create a single master point. The end result was one master point made from eight equalized anchors whose loads were shared across 51 individual anchor points – in this case magnets. The anchor was weight tested by people of varying sizes/weights and some even chose to bounce test it. Minimum breaking strength was never determined but I think it’s wise to call this one body weight only. I’ll be the first to admit that this magnet anchor is not the most practical when it comes to field use but it’s an excellent training tool that highlights the concept of load sharing anchors and importance of equalization. WARNING: Magnets are not reliable anchors. Using a magnet or magnets as life support can and will likely kill you. Untethered magnets will fall if they fail so if using this for training purposes don’t make the same mistakes pictured here – wear a helmet, have a separate belay line, and place a crash pad underneath you. Heck, grab yourself an umbrella while you’re at it. Have fun but be careful. Long bottom lines on a banner, when used properly, make it possible to “fly” a banner like a kite and can reduce risks associated with high wind loads. There are many things to consider when taking action in vertical environments but few can surprise you as much as wind. This is particularly true when dealing with banners where high winds can be treacherous. To put this in perspective, imagine deploying a 80 x 20 foot banner on a calm day. You’re unexpectedly caught by 20 mph wind gusts that culminate to over 3,000 lbs of force on the banner — and you’re still attached to the bottom line. You haven’t tied off the lower corner of the banner and are now flying a sketchy sail. “It’s like riding a bull,” explains my good friend Cy Wagoner. Wind forces can throw things around, tangle ropes, rip banners, push or pull people away from structures, jeopardize work/safety, and put a sudden end to a camp or occupation. In either case, the result could be challenging (to say the least) or even catastrophic. 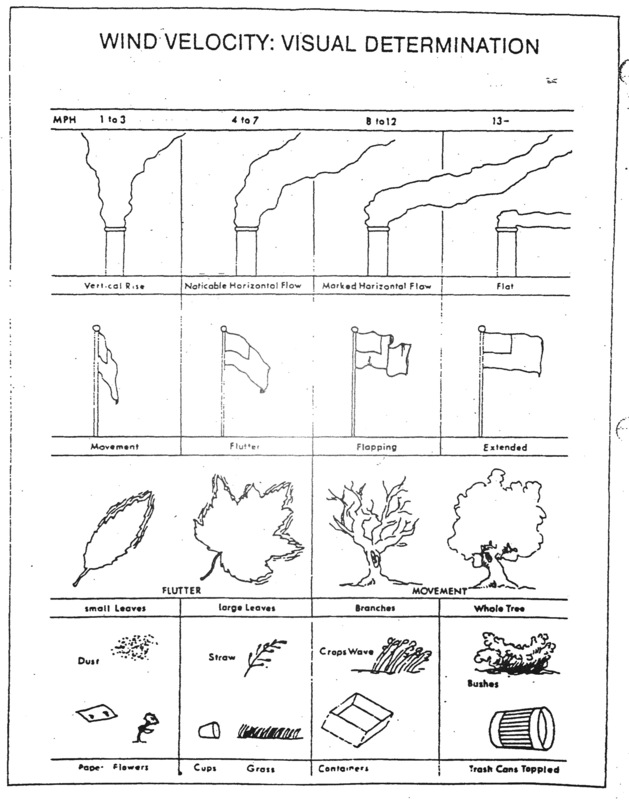 The following chart is one of many adaptations of the Beaufort Scale and is used to identify wind force on a scale of 0 to 12. This along with wind velocity visual determination methods (see below) are practical tools for assessing wind speed in the field. When working with banners it’s good practice to consider potential wind loads that a banner may be subject to (the same holds true for any large object). 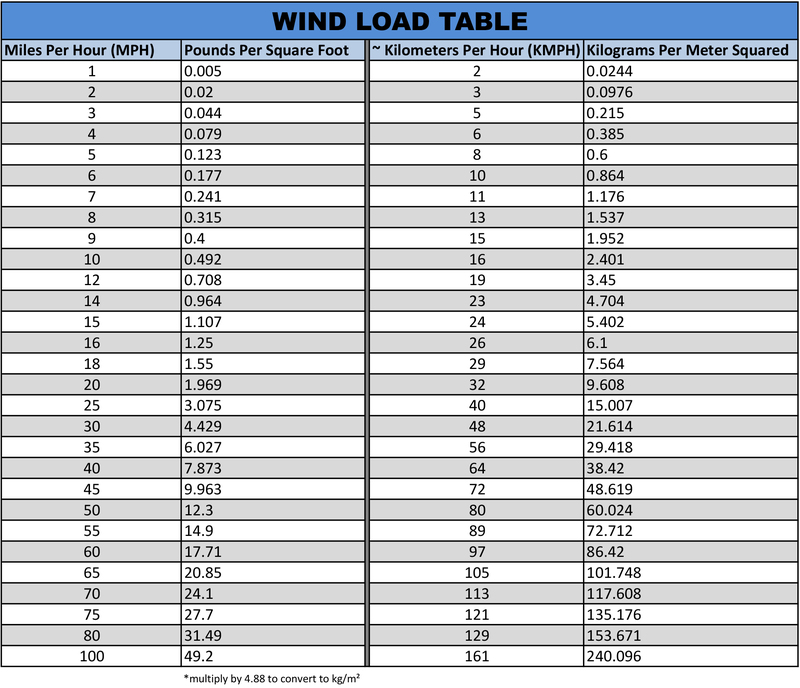 The following table has been adapted from the Scaffold Training Institute manual and offers some conservative numbers for approximating potential wind loads (basic math skills required). It does not account for direction, angle, material types, and other variables so consult a structural engineer or physicist if a high degree of accuracy is desired. Better yet, speak to those with first hand experience. Remember, respect the wind and account for it in your planning — this should include risk mitigation and a wind response plan in case of unsuspected gusts. Plan accordingly and consult those with experience. Greenpeace activists hang a large warning box on the outside of an E.ON coal-fired power plant at the Maasvlakte. Photo: Philip Reynaers – June 2006. Like most climbing questions, there is no single definitive answer. It depends. Most climbing things we have learned and probably pass on others are “rules and rote”. Since climbing can be dangerous, we learn rules that we guard as absolutes. For example, “Never smoke cigarettes around your gear” and then you find that occupational folks do it all the time with no discernible problem. Or never use bleach on rope period, then find out that fire rescue teams have protocols for decontaminating ropes with bodily fluids using chlorine bleach solutions. Here’s a story to highlight my point. I remember long ago being taught that if I dropped a carabiner from six feet on to concrete it could cause fractures that could cause it to fail under load. Is that true? Are carabineers really that fragile? Well the answer is no, not anymore, but they once were. When the first aluminum carabiners were made for the military the gates were made of cast aluminum. They were subject to fractures and cracking where the pin connects the gate to the main body. The military didn’t use them for lead climbing and tended not to put them in shock loading situations. These wonderful light weight carabiners quickly made their way into the climbing community and eventually so did gate failures which were much more severe from a leader fall shock load. These little lightweight gems were handled like eggs and strict rules were formed. Many people still adhere to these rules today not knowing why the rule was formed or if it still applies. Guess what? It doesn’t. Carabiners haven’t used cast aluminum for almost four decades (read about the history of carabiners). Tests have been done where modern forged aluminum carabiners have been hurled down 40 feet onto solid rock and they break tested 100%. Many modern carabiners could actually be made stronger by smashing them with a hammer as the metal could be further cold forged. Not that you should try this but it adds some color to the picture. If you don’t know the basis of a climbing rule stick to that rule, it could save your life after all. Mold and mildew will not have any appreciable strength reduction for the fibers used in modern life safety ropes (nylon, Kevlar, spectra, Dyneema, etc). Long ago climbers used manila, hemp, sisal and various other natural fibers and mold could destroy these types of rope in very short order. In those days if you stored a rope wet, you might just as well stored it in the trash can. 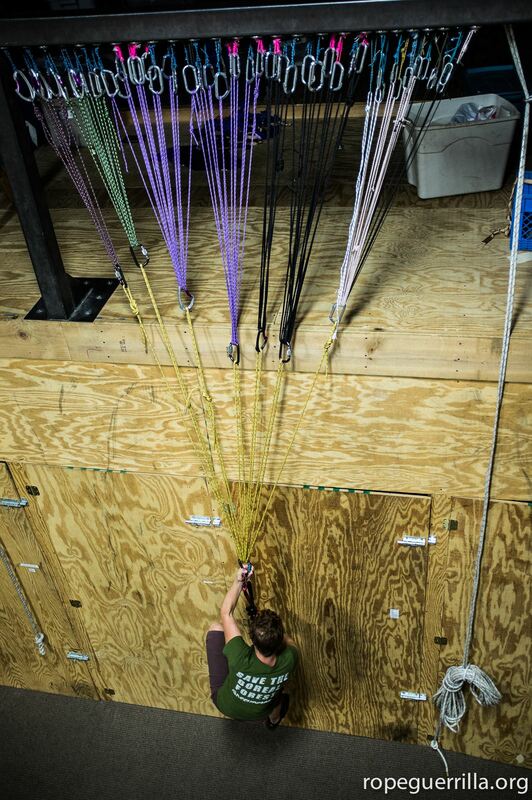 Synthetic fibers have entirely replaced natural fibers in the climbing world. Since almost all life safety ropes that stretch are made of nylon, let’s focus on that. Mold and mildew cannot “feed” on nylon. The bacteria will not eat or dissolve the nylon fibers. If you have nylon fabrics that are in fact covered in either mold or mildew, the mold or mildew is growing on something else in or on the rope (sweat, urine, sugar, etc). If, for example, you had a rope that became wet and developed mold and you took that rope and thoroughly dried it, the moldy dry rope would be far stronger than an identical new wet rope. Nylon can lose about 20% of its strength when soaking wet. 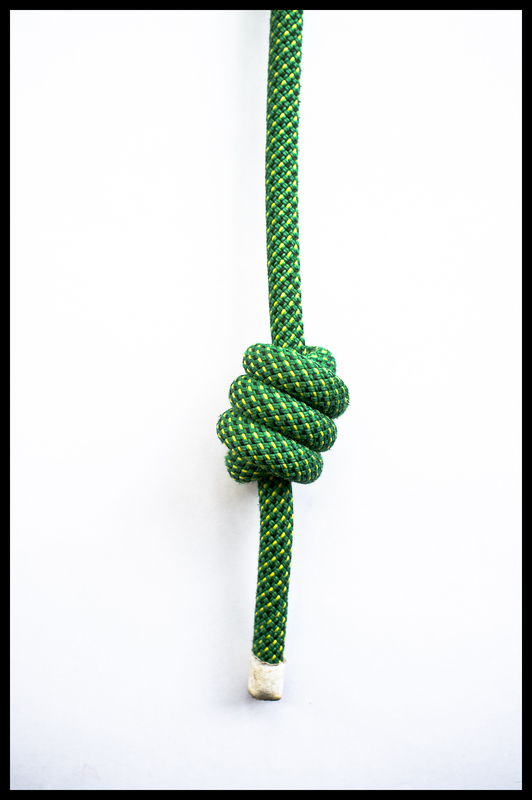 Most climbers wouldn’t worry about using a wet rope if they got caught out in the rain (or for that matter the knot that can reduce 20 – 40 %). Now, if you had a rope that was covered in mold or mildew, strength is not an issue, but friction might be. 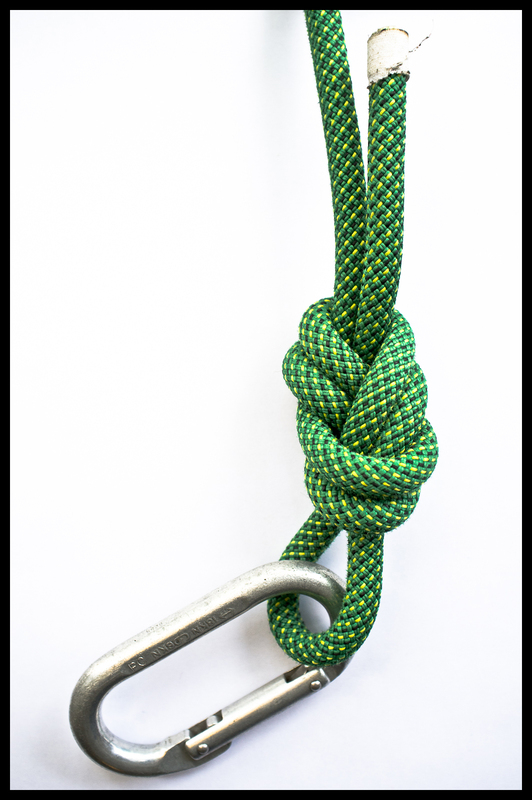 Rappelling or friction hitches on a mildew clad rope might require additional measures to add friction. Naturally one would clean and dry the rope before using it, so this not likely to be an issue. But worth knowing if you are faced with that situation. In my experience what most climbers think is mold and mildew is actually staining. Nylon fibers will absorb water (which is why wet ropes are weaker) in this process ropes that have become wet (either soaked or from humidity) will absorb a lot of staining materials as well. Even nylon ropes that have never been wet or humid will absorb very small particles of “gunk” and cause the rope to discolor (white ropes do not stay white for long). No amount of cleaning will remove these absorbed stains. Just imagine all the aluminum powder, chalk, dirt, sweat, etc, that covers any average rope. Get the rope wet and all that dark gunk will soak into the fibers. Not to worry as they are just colored particles and too small to cause any damage (grains of course sand are a different story). Coil a rope with your bare hands after a day of climbing and you will see on your hands how dirty ropes are. If you actually are dealing with mold, mildew or other bacteria, when dried you will see spores and powder growing larger than the rope fibers. You would be able to scrape some off and see the pores becoming airborne. If you are dealing with mold and mildew, you will just need to wash the gear and dry it properly. It will still be covered in stains when you’re done, but this will have no effect on the strength. As always, properly storing gear to keep it dry is wise well practiced rule. However a rope stored for a year in distilled water, that is then properly dried is still as good as one stored dry. But a nylon rope soaked for a year in chlorinated tap water is not (though still useable). Test have been done where a new rope was soaked in gasoline for six months and dried and tested. The rope showed some degradation, I think it was 5% – 10% but was still usable, a bit smelly though. Nylon is made from petro-chemicals after all. Proper gear storage is important and it is a reflection of how one treats and maintains their gear. If someone said “let’s go climbing I have all the gear right here.” and then pulled out a moist moldy rope, I would be a bit suspect about how well the rest of their gear is taken care of. So, the answer is “it depends”. What’s the rope made of? What’s on the rope? How was the rope stored when it got wet? Where was it stored? However, to the question “will mold or mildew appreciable affect the strength of nylon rope?”, the answer is no. 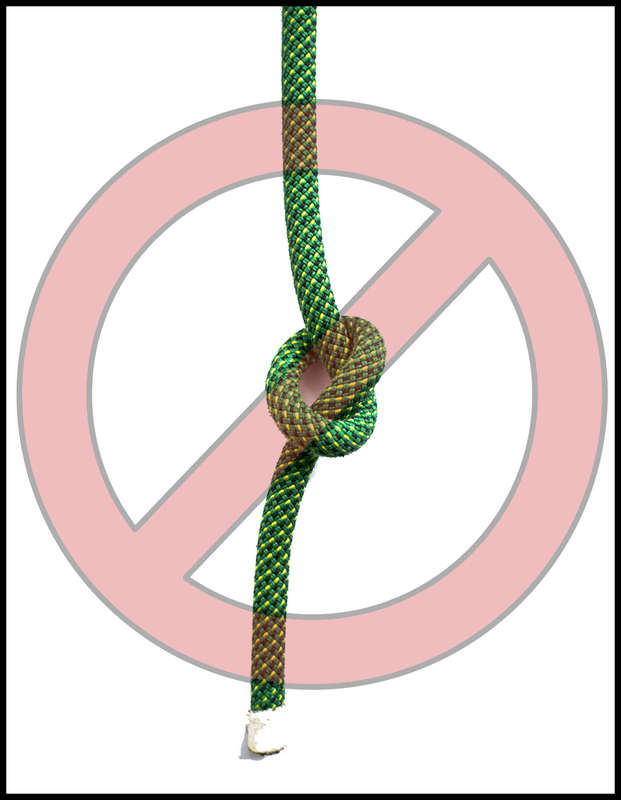 A stopper knot is any knot tied at the end of a rappel rope that prevents a climber from rappelling off the end of the rope. 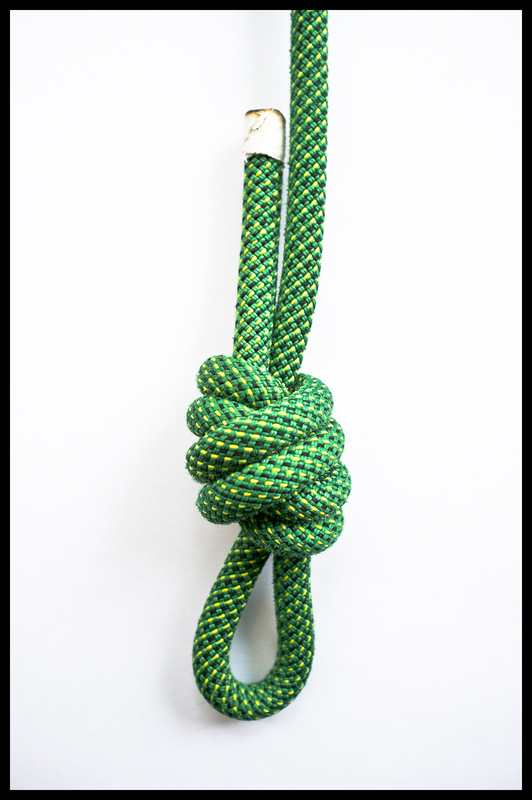 Many accidents and fatalities are a result of insufficient stopper knots or none at all. In July of 2009 I had a stopper knot slip thru my hand while wrestling with a banner on Mount Rushmore near Keystone, South Dakota. Things were hectic and I was exhausted and dehydrated. It happened fast and before I knew it I was 300ft in the air and hanging out between good ol’ Teddy and Abe with a double overhand stopper knot jammed into my rappel device (I was using the Petzl STOP). Moral of the story? Tie a knot at the end of your rope! 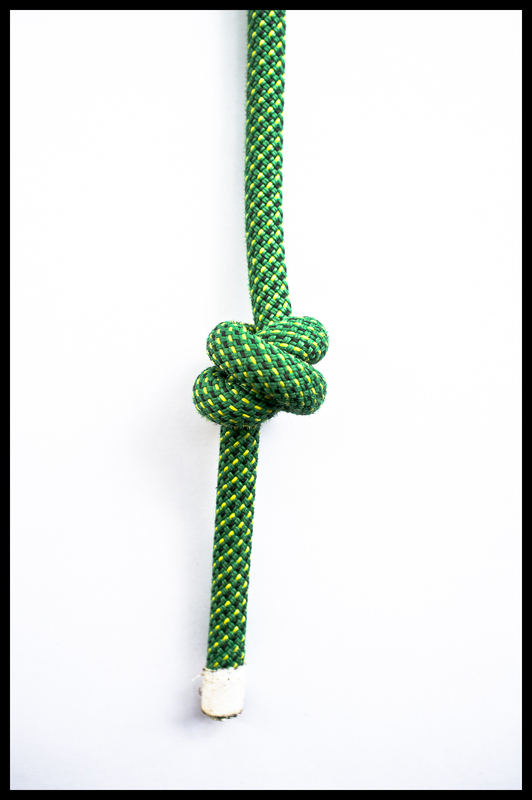 But remember – NOT ALL STOPPER KNOTS ARE CREATED EQUAL! 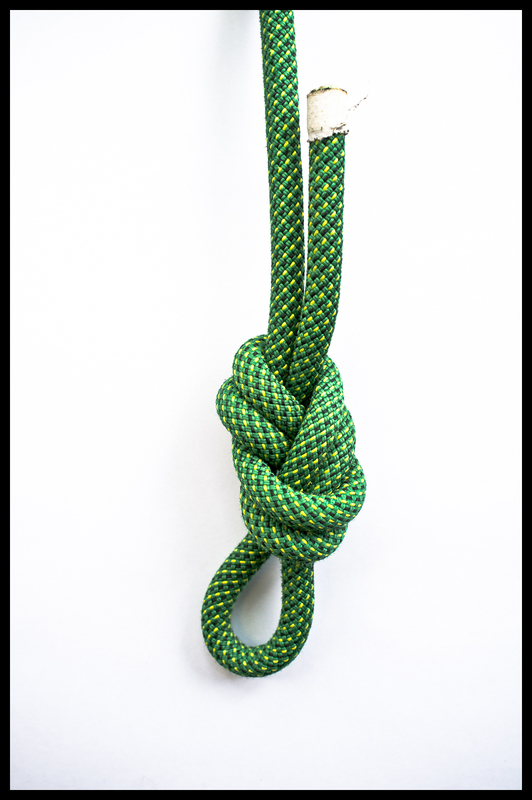 NEVER use a single overhand knot as a stopper knot! They can slip thru rappel devices. Stopper knots come in all shapes and sizes. Choosing which is best can prevent a lot of hassle and even save your life. 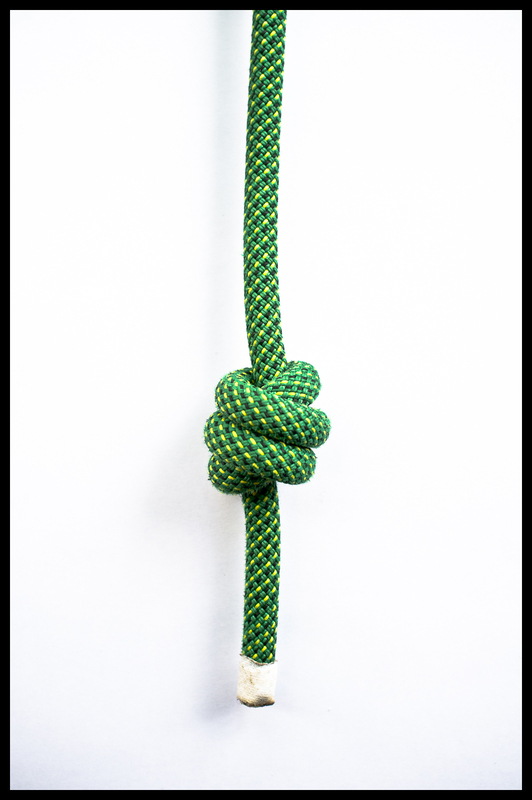 Use this list of six with the rules above to help you choose the best stopper knot for any given situation.